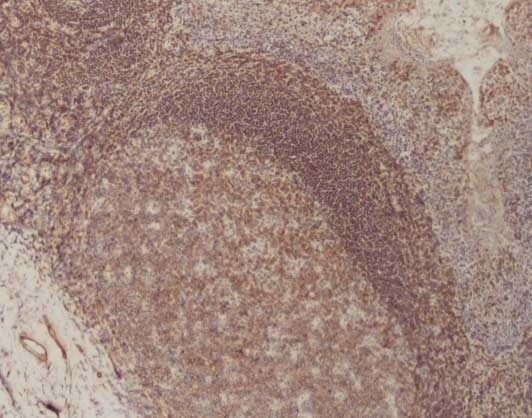 Human anti Human CD127 antibody, clone AbD11590 recognizes the alpha chain of the human interleukin-7 receptor (IL-7R), which is also known as CD127. CD127 is a ~65-75 kDa transmembrane glycoprotein that associates with the interleukin-2 receptor gamma chain to form the functional high affinity IL-7 receptor. CD127 is expressed on lymphoid precursors in the bone marrow, pro-B cells, a subpopulation of thymocytes, T-cells and monocytes. CD127 is the specific receptor for IL-7 and the IL-7 receptor plays a critical role in lymphoid development. A bivalent human recombinant Fab selected from the HuCAL® phage display library, expressed in E. coli. This Fab fragment is dimerized via a helix-turn-helix motif. The antibody is tagged with a DYKDDDDK tag and a double extended Strep-tag at the C-terminus of the antibody heavy chain. This antibody is supplied lyophilized. 1HCA144 has been demonstrated to function in Flow Cytometry, however Bio-Rad recommend the use of clone 11592 (HCA145) which demonstrates stronger staining.